There are some things in life that, had you only known them before, could have saved you a whole bunch of mission and effort. Wetting the tip of the thread before you poke it through the eye of a needle is one of those. Rolling the batteries on the remote to give you more lifespan might be another. 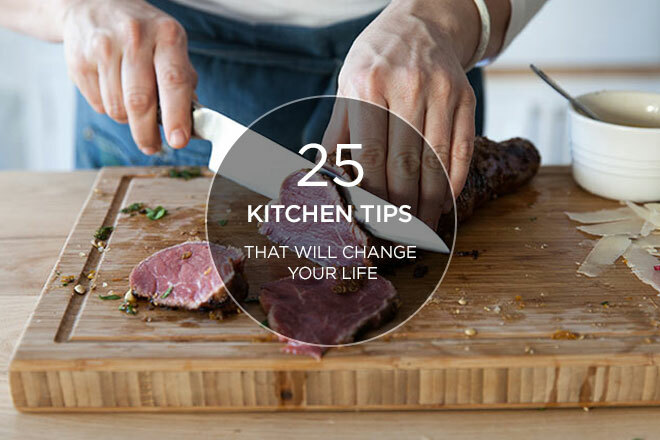 When it comes to the kitchen, we’ve rounded up our 25 tips that will save you much fuss and bother. To the kitchen we go. 1. If you place your meat in the freezer for a bit, it’ll be easier to cut those wafer thin slices for carpaccio. 2. Don’t bother peeling garlic, just cut off the root end and squish it with the flat side of the blade. 3. Bacon. Unless you’re veggie, it makes most things better. 4. You can peel ginger with a spoon without losing all that extra ginger. 5. Use unscented floss to cut through soft things like cheeses or cakes. 6. Keep your butter in the freezer and then grate it for baking and pastries. It mixes into the flour easier and melts quicker. 7. Egg shells are best for fishing out bits of egg shell. Why? Because they’re sharp and cut through the egg. 8. Freeze left-over French press or pour over coffee into ice trays. They make for blitzing quick ice coffees without diluting them. 9. Pop frozen grapes into your wine to keep them chilled and undiluted. 10. Eggs peel easiest if you add some bicarb to the water and then pop it in cold water afterwards. 11. Freeze bananas without their skins (because they’re a hack to peel when frozen) for epic smoothie additions. 12. Citrus fruits, tomato, cheese and chocolate all taste best at room temperature. 13. Using Spray ‘n’ Cook in measuring cups before measuring sticky ingredients like honey and syrup, makes them slide right out. 14. Before chopping chillies, rub your hands with veg oil to prevent them from absorbing the chilli oils. 15. Take your pasta off the stove just a tinge before al dente. When you pour it into the colander, quickly pop the pot back below to catch the water. The steam will keep the noodles hot and stop them from sticking. 16. To remove any funny food odours from your hands, washing them with salt or rubbing your hands against the stainless steel tap work a charm. 17. Don’t let leftover wine go to waste. Freeze it in wine cubes and use for adding to sauces like bolognese. 18. Pop a celery stick into the bread bag if it starts to go off. This is said to restore the freshness for a bit. 20. Soak popcorn kernels in water for 10 minutes, drain then pop, for super-quick popping, fluffy popcorn. 21. Peel the potatoes after you’ve cooked them and soaked them in cold water for a while. Skins come right off. 22. Separate your bananas (and store them away from other fruit) to prevent them from going off quicker. 23. Chicken breasts taste best if you whack them with anything sturdy (like a rolling pin) beforehand. Meat tenderising is a thing. Or cut them across the grain (short sections, not long) as this also cuts the fibres and looks best for serving. 25. Clean an egg boiler by boiling it for a short while with a bit of vinegar in it. It will lift and dissolve everything. Those are our life changing tips, head to our Facebook page for a handful more of seriously great kitchen tips and tricks from you guys (no really, you guys take the cake on this one – thanks for sharing). And remember, if you try any of them at home let us know! Share them with us on Twitter, Facebook or Instagram using #YCTips so we can see them.